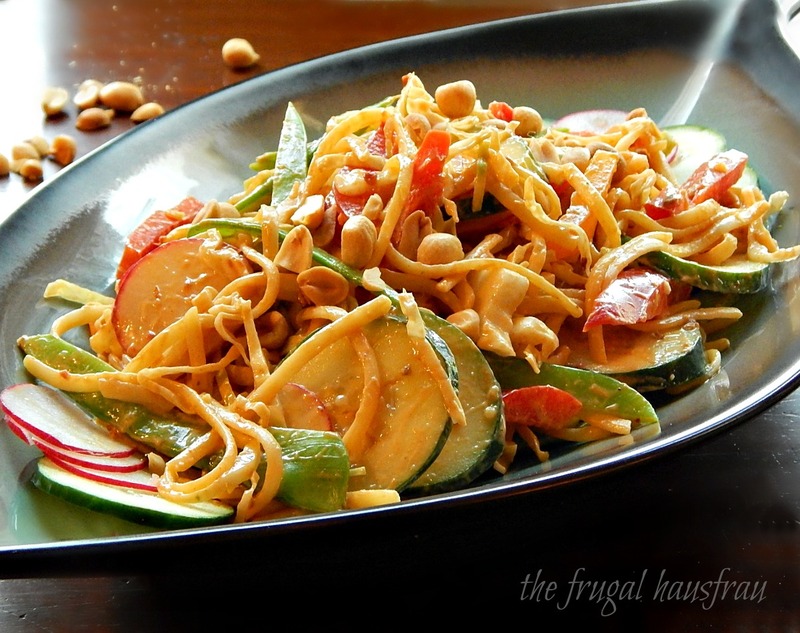 With the holiday coming up, I’m craving what seems to be commonly dubbed Cold “Asian” Peanut Noodle salad. This is a great dish for a party, cook out or a potluck, Really, you never know who might show up at a party and this is popular with vegetarians and meat eaters, alike. This Cold Asian Noodle Salad is loaded with all kinds of very delicious and good for you stuff and a lot of fantastic flavor. It can pass off easily as a main dish or a side. It’s chock full of vegetables, cool, creamy, crunchy and delicious, with just the faintest hint of spiciness. You may have noticed the little quotation marks under “Asian” at the top of the page. This type of “peanut sauce” is riff off the real thing: lime stands in for Kafir lime leaves, molasses for tamarind, peanut butter for roasted and ground peanuts. To see an actual recipe for peanut sauce, I recommend the Asian Grandmother, one of my favorite blogs. Be sure to play with your food – you’ll probably want to customize and add a little more of this or that until you reach your “Ah yes.” moment. Myself, I like a good splash more of vinegar and quite a bit more chili paste. Just keep in mind the peanut sauce flavors the whole Cold Asian Noodle Salad, so you want it intense enough to carry the pasta. I make sure to garnish with the peanuts – that’s going to flag anyone who has an allergy. Other than that, go wild with this and add more or less of any of the veggies, using ones that you like. I’m kind of a stickler for quickly blanching the snow peas and giving them a slice or two. It makes them so much easier to eat and gives them a gorgeous color. If you haven’t tried doing that, give it a go and see what you think. Watch for great sales prices on the vegetables for this salad, and make it seasonally, using what’s at hand, and it will come in at a budget price. As far as the noodles and peanut butter, they’re pretty much staples that last for a good amount of time. Cut your coupons and wait for a good sale and stock up at a low. Freeze any products containing flour for three days when they come into your home and you’ll have no worries. Bring salted water to a boil; blanch snow peas for a minute and then plunge into ice water. Cook noodles to al dente in the boiling water according to the package directions. Drain and cool with running cold water. After they’ve sat for a few minutes and the excess water has drained off, toss with a teaspoon of the sesame oil. Mix sauce ingredients together, taste and adjust. Thin with a bit of hot water if necessary – you’ll want it thick enough to coat the vegetables and noodles, but not so thick it that it stiffens up when cold. Prepare vegetables. In a large bowl (I generally use the pot I cooked the noodles in so as not to dirty another dish) toss all ingredients, except the garnishes, together. Serve cold, topped with crushed peanuts, thinly sliced green onion and a wedge of lime. I’ll be bringing this recipe to Angie’s Fiesta Friday #187, hosted this week by Judi @ cookingwithauntjuju.com and Sadhna @ Herbs, Spices and Tradition. Pop by Fiesta Friday to see what everyone else is sharing and take a peek at our co-hosts blogs, too. Ignore Lime color when buying. Pick up several and buy the ones that feel “heavy” for their size – those are the ones that are full of juice. 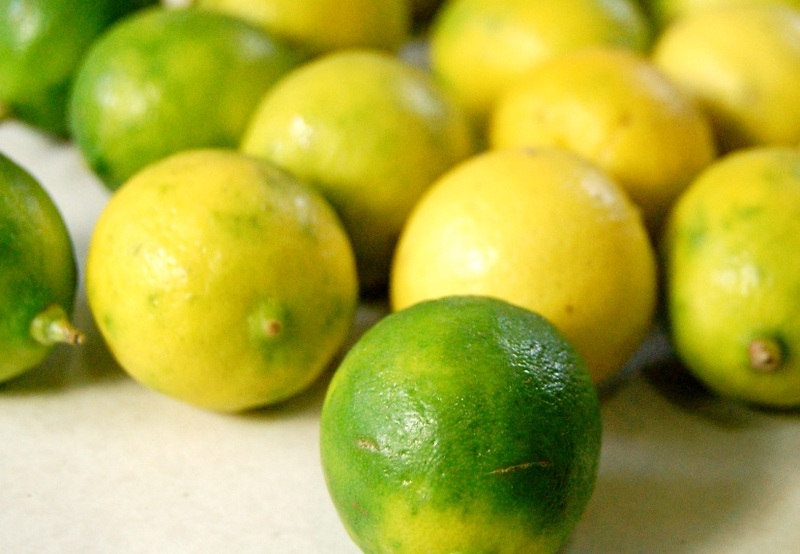 The lime, above, was almost yellow and one of the juiciest limes I’ve ever used. Click here for more hacks! I don’t think there is any “right” or “wrong” way of making this dish. Recipes may have garlic, ginger, Shaoxing wine, Mirin, honey, soy sauce, Kafir lime leaves, & Sriracha in addition to the above ingredients. Choose your favorite vegetables. Broccoli comes to mind, cut small and quickly blanched. Mung bean sprouts, water chestnuts, daikon, carrots – use what you like! The noodles, too, seem to differ in every recipe – Udon, Soba, or even plain old pasta – use what you like and what’s available. This entry was posted in Click here for Bargain Meals, Click here for Fabulous Food Posts and tagged Asian, Bargain Meal of the Week, Bell Peppers, Cabbage, Cucumber, Frugal Hausfrau, Lime, Main dish salad, Nuts and Seeds, Pasta, pasta salad, Peanut butter, peanuts, radish, Salad, Side, snow peas, udon, Vegetable Side, Vegetarian Meal. Bookmark the permalink. Love your “ah, yes moment” method of cooking Mollie! It does look just right for these last hot days, cool and veggies keep it light. Great one! I’ll have to go check the Asian Grandmother blog! thanks!! Thanks Rhonda! Sometimes I cook and forget to taste, believe it or not! I love the Asian Grandmother and she’s actually part of a SMithsonian heritage project now and has moved her new blog postings there. I think there’s a note on her homepage. Thank you!! 🙂 So easy and delish!! Oh my gosh! I love this! It’s breakfast time and I’m wishing I had your salad to eat! One of my favorites as I have a bunch of peanut sauces on my blog – I am amazed at the differences. I also checked out the Asian grandmother. Thanks for sharing Mollie and Happy FF! I love the colours in this dish. So pretty. Gosh, thank you!! It’s a particular favorite of mine!